"Who can fathom the depths of another man's heart?" Harakiri (Seppuku), director Masaki Kobayashi's powerful indictment of social structures, in this case the Tokugawa shogunate, which demolish the individual's dignity in favor of authoritarian rule, is a superb film. Set in 1630 near the beginning of the famous shogunate's rule, Harakiri (Seppuku) exposes Tom Cruise's vain attempt at multiculturalism, The Last Samurai, for what it is—a mindless narrative based on inane American notions of the samurai. Kobayashi's film is a subtle, astute tale full of outrage and profundity. As the film opens, momentous change is sweeping across Japan, causing many samurai to fall into exile as ronin, masterless samurai. Despite the changes, the Iyi Clan is prosperous and adheres strictly to their oaths. Thus, when a man claiming to be a retainer of the fallen Fukushima Clan arrives, they question his motives. Hanshiro Tsugumo (Tatsuya Nakadai) asks permission to commit harakiri, ritual suicide, in the Iyi Clan's forecourt. The counselor, Kageyu Saito (Rentaro Mikuni), is skeptical because many ronin have been attempting to extort money from various clans by playing to their sympathies under the guise of this sacred ritual. Saito meets with Tsugumo in private, speaking frankly in the ascetic environment, telling the story of a young man, Motome Chijiiwa (Akira Ishihama), who made the same proposition. Through a series of vivid flashbacks, Chijiiwa's fate at the austere hands of the Iyi Clan is revealed. Exposed as a scoundrel, they force him to commit harakiri with his bamboo sword. The story does not phase Tsugumo, however, who confidently informs Saito that he has every intention of slicing his own abdomen. The ceremony is prepared, but Tsugumo makes a request for the great Iyi swordsmen Hikokuro Omodaka (Tetsuro Tamba) to assist in the ritual. Omodaka is absent due to illness, so Tsugumo makes two additional requests for samurai who are also absent. Each of the three requested men was intricately involved in Chijiiwa's excruciating death, prompting Saito to suspect Tsugumo of a conspiracy. As they wait for news on the three missing samurai, Tsugumo tells the story of his life and reveals his relationship to Chijiiwa. There is no telling how things will play out, but Saito and Tsugumo find themselves locked in a battle of wills that could very soon turn into a deadly duel. Kobayashi's direction is patient in its storytelling. Working from a script by Shinobu Hashimoto (most famous for Rashomon), Kobayashi shifts focus between the Iyi courtyard and Tsugumo's story with great skill, allowing the flashbacks to slowly reveal all the events that led up to Tsugumo's arrival. Watching the events unfold, I found myself mesmerized by how little actually happens. In many ways, Harakiri is the antithesis to Kurosawa's brilliant samurai pictures. Apart from the violent and unbridled demise of Chijiiwa (shown in unblinking horror, with canted camera angles heightening the effect) the movie is mostly calm and little more than two men conversing in front of a large audience. Yet, there's a kind of spectacle in all of this. The richly adventurous black-and-white cinematography by Yoshio Miyajima merges both serenity and chaos, capturing the alluring production design with tremendous realism. Furthering that sense is the musical score, bringing emotion and drama into perfect harmony. The filmmaking is so good that I genuinely felt like I was sitting in feudal Japan while watching it. There are flaws, however, in the storytelling. At 133 minutes, Kobayashi could employ some judicious editing to strengthen the film's effect. There are moments when the courtyard scenes lag, taking the audience out of Tsugumo's drama. However, the extended length is made durable by Tatsuya Nakadai's incredible performance as Tsugumo. Only 30 years old when making the film, Nakadai embodies his character with zeal and intelligence. The ragged beard and tethered clothes further his performance, which contains a range unusual in Japanese films of the period. The dialogue is poetic, employing a kabuki aesthetic and mixing it with method acting. Pay special attention to the early scenes when Nakadai is listening to his fellow actor, Rentaro Mikuni. The two create a tension that seeps off of the screen and into the viewer. 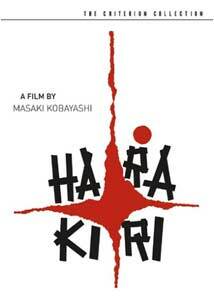 Harakiri is a classic piece of cinema. The themes of the film, which are antiauthoritarian, are timeless and raise many questions. What is honor? Who decides whether an act is honorable? What is the price of humanity? Kobayashi weaves these questions into a stunning story that can only be appreciated by viewing it. Image Transfer Review: The 2.35:1 anamorphic widescreen transfer is beautifully restored. Frankly, the film looks like it could have been made last year. Detail is strong, depth is affluent, contrast is wonderful, and nary a print defect can be found. Absolutely amazing! Audio Transfer Review: The original Japanese monaural audio is preserved on this DVD. Playing in one channel, there's a noticeable hiss throughout. It is not especially distracting, though in moments of silence it obviously calls attention to itself. Otherwise, this is a fine audio mix. Insert�a 32-page booklet featuring an essay by film scholar Joan Mellen, in addition to a reprint of her 1972 interview with director Masaki Kobayashi. Donald Richie Introduction�a video introduction to the film by Japanese-film historian Donald Richie. Interviews�separate video interviews with director Masaki Kobayashi, star Tasuya Nakadai, and writer Shinobu Hashimoto. Poster Gallery�a collection of various posters from the film's original release. Extras Review: The two-disc special edition DVD makes ample use of the medium. The collectible booklet starts things off with an insightful essay by film scholar Joan Mellen. Touching upon the themes of the film, Mellen contextualizes it in Japanese cinema and Japanese culture in general. Accompanying her essay is a reprint of Mellen's interview with director Masaki Kobayashi. Conducted in 1972, the interview is also interesting, as Kobayashi goes into the entire history of his career to that point. A lot of time is devoted to his other films, such as The Human Condition and The Thick-Walled Room, and even more focuses on his general ideas about life. The eloquent words provide good food for thought. On Disc 1, a video Donald Richie Introduction (11m:56s) explores the Japanese-film scholar's initial reaction to the film in 1962. He recalls being in awe and uses this as a platform for explaining Kobayashi's place among other Japanese auteurs. Some of his analysis of the film is akin to Mellen's piece, but the content is still interesting. Also on this disc is the film's original theatrical trailer, shown in 2.35:1 widescreen. I recommend holding off on both of these features until after seeing the movie, since both reveal information about the plot that some may wish to avoid. Disc 2 features a collection of interviews with the talent behind the film. The Masaki Kobayashi Interview (09m:06s) was conducted for the Directors Guild of Japan in 1993, with filmmaker Masahiro Shinoda. Kobayashi does not say much, with most of the time consisting of Shinoda's praises for Harakiri. However, some information is conveyed here that is new and Kobayashi also discusses how he arrived at some of his ideas. Following that is A Golden Age: Tatsuya Nakadai Remembers Harakiri (14m:28s). Nakadai is vibrant and talks very fondly of Japan's cinema in the 1950s. He goes into great depth about his reluctance to take the part and how Kobayashi directed him, making for a very engaging interview. The final interview, Masterless Samurai: Shinobu Hashimoto on Harakiri (12m:52s) is an interesting glimpse into his writing process. He talks about his original concept growing over a period of many years, until it finally poured out of him in a short period. He discusses the use of flashbacks and offers some keen insights into them. The final supplemental feature is a gallery containing poster art from various nations when the film was originally released. The strong collection of extras rounds out an already impressive DVD. A tremendous success of filmmaking and acting, Harakiri (Suppuku) receives lavish treatment from the Criterion Collection. A beautifully restored picture and soundtrack, accompanied by impressive supplements, make this one of the best DVD releases this year.